A Blog Of Ice Cream: Valentine's Day - Ice Cream or Nigella's Coca Cola Ham? Valentine's Day - Ice Cream or Nigella's Coca Cola Ham? Well, Valentine's Day is just around the corner and I can't believe it's a year already since I wrote my last Valentine's Day Ice Cream blog post. My suggestion then was to make Valentine's Day extra special by actually making something yourself for your Valentine as opposed to just buying something. Let's face it, showing that you're prepared to put in some personal effort has to be viewed as a genuine token of affection. Last year I suggested making some homemade ice cream based on your Valentine's favorite ice cream flavor such as strawberry ice cream or chocolate ice cream. 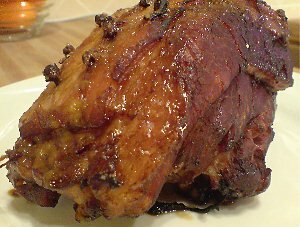 Whilst this still rings true as a great idea, for those of you looking for a culinary idea but perhaps a main course rather than a dessert, here's a recipe that a friend of mine, Elaine Rogerson, told me about recently and said was wonderful - Ham In Coca Cola. Sounds a little unusual? Well, that's what I thought but as you can see from the photograph this is a serious dish. (Thanks for the super photo Elaine) I also found other people on the Net raving about it. Elaine tells me it's a recipe by Nigella Lawson who is a British TV cook so I looked it up on the Net and here's the recipe along with some reviews. You can also find it in Nigella's book 'How To Eat, the pleasures and principles of good food'. Any vegetarians reading this post might be a little disappointed if I didn't also quote a non-meat dish so here's one, again from Nigella Lawson - Double Potato & Halloumi Bake. Like the Coca Cola Ham, I haven't tried it but it sounds delicious. The truth is I have tried other recipes by Nigella and they've been so good that I trust pretty much everything she recommends. The hit of our Christmas Dinner in fact was her recipe for roast parsnips in maple syrup and that was fabulous and as my friend Elaine is a pretty smart, Scottish lady (she's involved with an international security systems company with things like Multisys Security), she knows a good thing when she sees it - so I know better than to ignore her advice about the Coca Cola Ham!